Frog tadpoles eating dead newt? This apparently gruesome scene was spotted by David and Avril Haines in a roadside pond at Culkein Drumbeg (NC1033) on 14th April 2015. 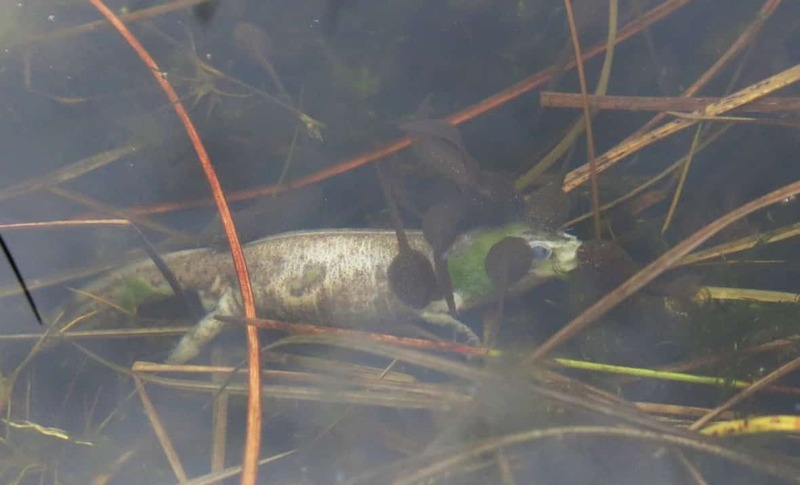 It appears to show Common Frog tadpoles feeding on a dead Palmate Newt, but it is not what it seems. At this stage in their life, tadpoles are vegetarian, using seven series of horny ‘teeth’ around their beak-like mandibles to graze on green algae and other vegetable matter. Later, when their legs begin to develop, they become carnivorous. So these tadpoles are actually just feeding on the filamentous algae which cover everything in such places, as the water warms up, including dead newts and any spawn that has failed to hatch. Later on, who knows?